Minimize the damage to your lawn and landscape – We hear it all the time, “I didn’t expect to need a $1000 of landscape work done after my project.” So much for inviting everyone over for July 4th to enjoy and show off your new patio, your lawn is wrecked and won’t be ready for enjoyment for at least another 3 months. Ugh! Don’t you wish that was communicated with you before the project started? While it’s hard to always totally eliminate lawn damage during a project, using protective lawn coverings and equipment with tracks designed to eliminate surface pressure & friction, we can minimize or eliminate the damage. And this perfectly leads until the next reason to consider us. Minimize the disturbance to your existing lifestyle – We get it. While this is just “another concrete job” to us, this undertaking may require you to make some inconvenient changes while it’s completed. Your toddler normally sleeps until 9am, but we want to start a 8am so a precious hour of your “me time” gets eliminated. Or the dog normally roams outside all day during the summer, but with the project going on and a section of the fence needing open to be down, Fido will have to stay inside which means “dog proofing” your home before you leave for work or buying a new leash to keep him out of the way. Whatever it is, talk to us and we’ll see if we can accommodate. We may not be able on everything and certain request may require a little more time or money, but let’s see what can do. Thankfully the next reason will help make it more bearable even if some your requests aren’t feasible. Minimize the time required to complete your project – You don’t want to sacrifice safety and quality. 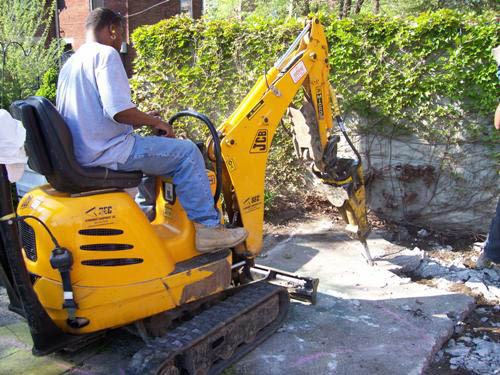 And you may not be in a rush to start your concrete project, but trust us, once it begins, you’ll want it done as soon as possbile Our advanced specialized equipment, some of which no other contractor in Greater Cincinnati owns , and our desire to employ methods the maximize project efficiency, will ensure that your project gets done as soon as possible. Again, this is without sacrificing safety or quality. Now if we can just get down controlling unforseen conditions such as the weather, we’d be almost perfect! Being readily prepared for “unforseen circumstances” – Sometimes no matter how well you prepare, there are some things you just can’t be ready for because all the planning in the world couldn’t have uncovered it. You just find out “as you go”. Like, what you ask? One customer’s driveway ended up being over 30″ thick in some spots versus the normal 4-6″. No one could have planned for that! We own our equipment and have special tools to handle things neither you or us could tell before a job starts. We had the necessary equipment to still keep the job moving forward without a long delay figuring out how to deal with it. We discussed the options and costs that would be involved with project scope changing and once approved, moved forward without losing much time. Many other contractors would have “lost a few days” trying to figure out a plan and find equipment to rent.